Unmanned Aircraft Systems (UAS) are being adapted for public safety use at the same time commercial and hobby use of these devices are interfering with first responder operations. UAS systems include small, medium and large drones, balloons and other deployable systems. The field of robotics is also expanding to assist public safety agencies perform a variety of missions. These include bomb robots, firefighting robots, and virtual presence devices that allow real time remote physician interaction. 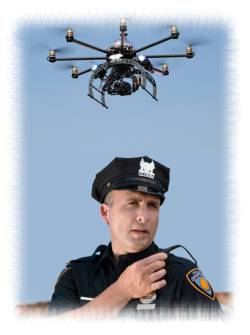 A number of public safety associations track UAS issues. This working group will examine the work of the International Association of Chiefs of Police (IACP), the National Institute of Science and Technology (NIST), the Federal Aviation Administration (FAA) UAS Integration Office as well as experiments and research studies being completed by academia. The group has moved to quarterly meetings and did not meet in August. The presentation given during the group's July meeting by Prof. Robin R. Murphy on work being done by the Center for Robot-Assisted Search and Rescue (CRASAR) has been used to create content for NPSTC's YouTube channel. Review the work being done by other groups and organizations to better understand the current landscape. Create list of use cases that document public safety use of these devices by law enforcement, fire/rescue and EMS. Review the current regulatory environment including issues that impact research, affect public safety use, and direct appropriate management of commercial and hobby devices. Provide input on pending rule making actions which will impact public safety operations (either directly or via regulation of commercial and hobby operations). Consider the need for additional spectrum to communicate with Public Safety UAS and coordinate with the NPSTC Spectrum Management Committee. Develop outreach statements which will help educate the public safety community of the current state of UAS and robotic usage. Examine the need for best practices in the use of UAS and Robotic systems.